A totally distinct form of thermal study is ther­moluminescence dating. This is a method used to try to establish the age of archeologi-cal specimens. The method is based upon the idea that some materials, such as rocks and minerals, emit visible light when heated. The amount of light emitted is believed to relate to the amount of exposure to natural radioactiv­ity. This exposure is built up over an extended period of time. As a result, the greater the amount of light released, the older are the rocks. The age can be estimated by comparing the light intensity with the temperature. The same principle is now employed in personnel badges used for monitoring exposure to ra­dioactivity in laboratories. carrying out differential thermal analysis has a com­puterized temperature con­troller. It records the release or absorption of heat en­ergy by a sample while that sample undergoes chemical changes or changes in its physical makeup. In column chromatogra­phy,a mixed solution is poured into the column. 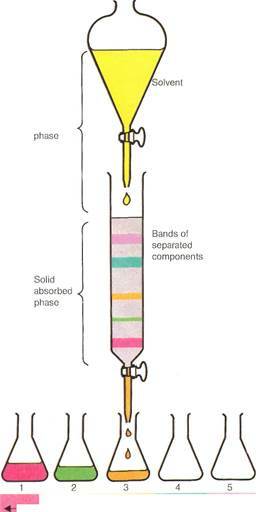 A solvent is then trickled through (moving solvent phase) to separate the mix­ture into bands (solid ab­sorbed phase). The various fractions can then be washed through one at a time using a series of other solvents. The basic principle underlying all methods of chromatography is simple. A substance in ei­ther liquid or gaseous solution (known as the mobile phase) passes through a stationary phase. The stationary phase is a packed col­umn or the surface of a solid material. The mo­bile phase slows down in its progress due to its interaction with the stationary phase. ments) can frequently be achieved at the same time.